HOUGHTON — While Michigan’s Upper Peninsula is not the sunniest place in the world, solar energy is viable in the region. With new technologies, some people might be inclined to leave the electrical grid. A team from Michigan Technological University looked into the economic viability of grid defection in the Upper Peninsula. Known for snow rather than sun, the region could still support a significant network of solar photovoltaic energy systems. Solar energy alone in the Upper Peninsula is seasonally restricted. However, solar coupled with cogeneration and batteries could overcome any cloudy, cold winter day. 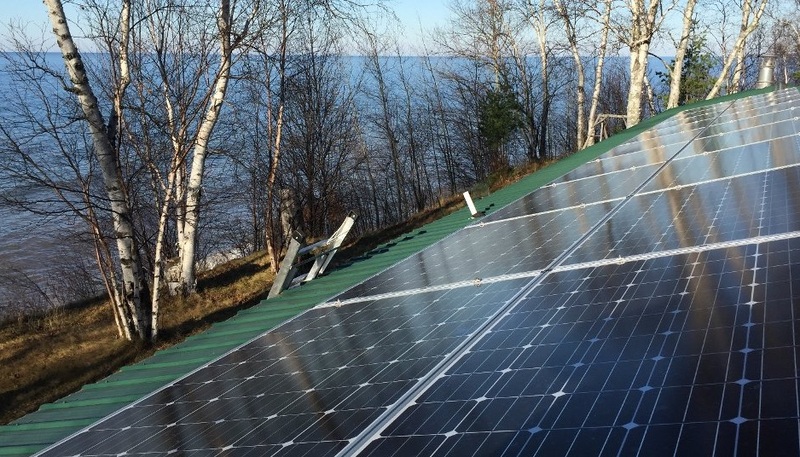 Michigan Tech engineers and sociologists explored what this new triple-threat technology, and the role of demographics, could mean for energy alternatives in the Upper Peninsula in a new study published in Energy Policy. Their analysis found that by 2020, leaving the electrical grid is a viable economic option for the majority of seasonal households (92 percent) as well as single-family owner-occupied households (65 percent). The study was published in the journal Energy Policy. Cogeneration systems are small-scale combined heat and power systems, which usually run on natural gas and produce heat as they generate electricity. They can function year-round and are most effective in the winter when solar production is low. Along with improved battery storage, these hybrid systems would not require being tied into the electrical grid. The costs of hybrid systems are coming down and are projected to keep decreasing. Recent advances in cogeneration, battery storage and solar have made going off-grid more economically viable for UP residents. Richelle Winkler, an associate professor of sociology and demography at Michigan Tech, led the demographic analysis. She used utility data on electric rates, data from the 2010 census and income estimates from the American Community Survey. In general, utility rates across the Upper Peninsula vary between average to some of the highest in the nation. Winkler also looked at the number and size of households in each utility service area in the Upper Peninsula along with how many homes are seasonal and how many are year-round residences. Net metering — under which solar-producing homeowners are fully compensated for their energy production, in essence giving them the right to sell they excess power they generate back to utilities at the retail rate — is the current policy in place in Michigan. In the Upper Peninsula, there are limits on how much grid-tied solar can be installed. If people did leave the grid, the researchers said, defection could be more disruptive for utility companies and pose challenges to maintaining existing infrastructure at reasonable costs to remaining customers. Also, two Michigan Senate bills (SB437 and SB438) just came out of committee that will keep a 1 percent cap on residential grid-tied systems. The UP is on track to meet that cap this summer. Many states, including Michigan, are looking at changing net metering and renewable energy policies, including charging consumers extra fees for installing rooftop solar systems and forcing consumers to sell excess electricity to utilities at the lower wholesale rate, not the higher retail rate. In most cases, the utility and fossil fuel industries are behind these proposals.